At the forefront of a rising tide of violence brought on by Galbadia's war declaration is a SeeD cadet named Squall Leonhart. Serious to a fault, Squall has earned himself the reputation of being a lone wolf. A chance encounter with the free-spirited Rinoa Heartilly, however, turns his universe upside down. Having thrived on discipline, Squall finds Rinoa's carefree attitude fascinating. Yet there is no time to ponder these thoughts, for the job of dealing with the sorceress behind Galbadia's irrational hostility has fallen to SeeD and Squall. Squall uses a sword called the Gunblade. This rare weapon takes many, many years to master and is therefore rarely used. 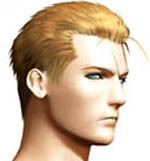 Currently, there is only one other Gunblade user in Balamb Garden-Seifer Almasy. 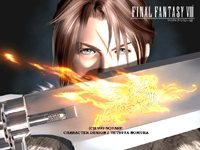 With the Gunblade, Squall can unleash his special skill, Renzokuken, a deadly series of punishing attacks sometimes followed by a powerful ending move. In the eyes of others, Squall is seen as a silent, cold person. Having this perceived image is fine by him. A member of the Timber resistance group "Forest Owls," Rinoa fights against the Galbadian President, Vinzer Deling, whose dictatorship has caused great suffering in her homeland for far too long. 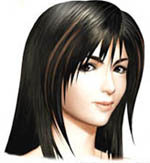 Rinoa is very emotional, and tends to go with her gut feeling when acting. Her best friend is her dog, Angelo, who often rushes into battle to help Rinoa when she is in trouble. The whip is Quistis' weapon of choice, but when faced with a dangerous situation, she relies more upon Blue Magic. 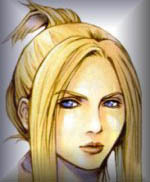 Quistis is much admired in Balamb Garden, and her admirers have even formed a fan club known as the "Trepies." She's a bit of a child prodigy considering she's the youngest instructor at the Garden. However, her actions toward her students sometimes betray her age and undermine her authority, as she lacks the stern demeanor of most Garden staff. 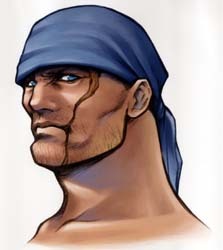 Zell, a master of close-combat fighting skills, uses kicks and punches to defeat his enemies. 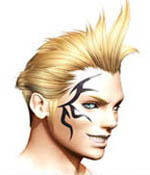 Zell also has a great passion for the hot dogs that are sold in Balamb Garden's cafeteria. Never one to cause problems to others, Zell's abundant energy, wild temper, and reactionary style sometimes get him into trouble. 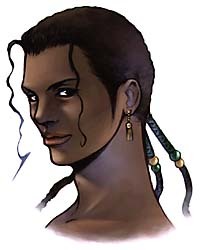 People in his hometown of Balamb view him as a "comic-bookish" type of hero, or a klutzy, poorly behaved person. Selphie is a recent transfer student to Balamb Garden. She grew up in Trabia Garden, located deep in the mountains on the northern continent. Her outgoing personality and sincerity have earned her many friends at Balamb and Trabia Gardens. Currently, she is busy trying to organize the Garden Celebration between training sessions. When fighting, Selphie uses giant Nunchaku and special magic that includes several unique spells. Irvine is touted as an expert marksman who can use special ammo to attack enemies. He puts on airs and attempts to convince those around him that he's a misunderstood loner, an image he uses to his advantage when courting female students. However, when placed in a pressure situation, he tends to shed his tough exterior and quickly loses his composure. Laguna is an energetic man with a big heart. Although a bit of a klutz, he's a strong leader who inspires a great deal of loyalty and respect from those around him. His weapon of choice is a machine gun, which can fire multiple shots at enemies posing a threat to his party members. Although he dreams of someday starting a writing career, he's currently serving in the Galbadian Army. One of Kiros' most distinguishing features are the sharp blades, called Katal, which he wears on both arms. His fighting style is also unique, just like his weapon. He has a very caring personality and a sharp wit. 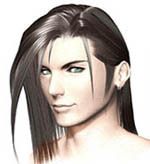 Little is known about Kiros, except that he fights alongside Laguna in Galbadia's Army. Ward is a big, powerful man. He carries with him an unusually heavy weapon, the Harpoon, which he throws at attacking enemies. Just like Kiros, Ward has been assigned to fight alongside Laguna in the Galbadian Army. His devotion to his friends is unwavering. Seifer has gained a reputation in Balamb Garden as a show-off and a snob. With his friends Fujin and Raijin, he acts as the Garden's Disciplinary Committee. Seifer is the only other Gunblade user at Balamb Garden besides Squall. The two have a heated rivalry that leads them both into trouble at times. 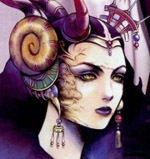 Very little is known about Edea, other than the fact that she has inherited the Sorceress Power at some point in her life. She only recently appeared for the first time, and seems to be working with Vinzer Deling, the Galbadian President. Her true intentions are unclear, but it seems unlikely that she will bring peace to the warring nation of Galbadia.